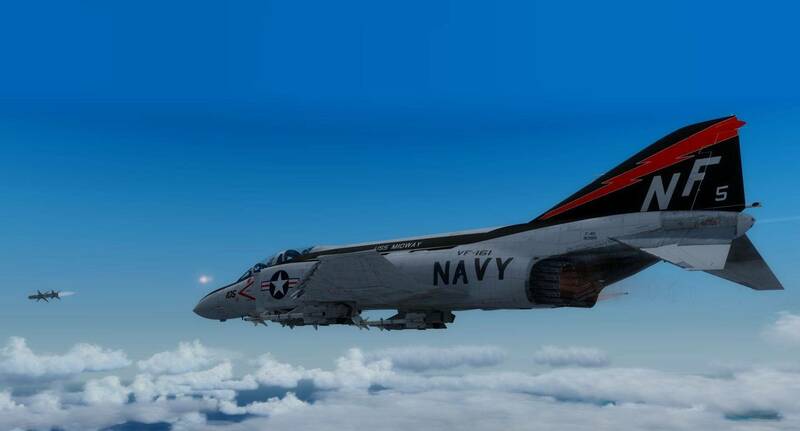 The F-4J, first flown in 1966, was an improved version of the F-4B for the Navy and the Marines. 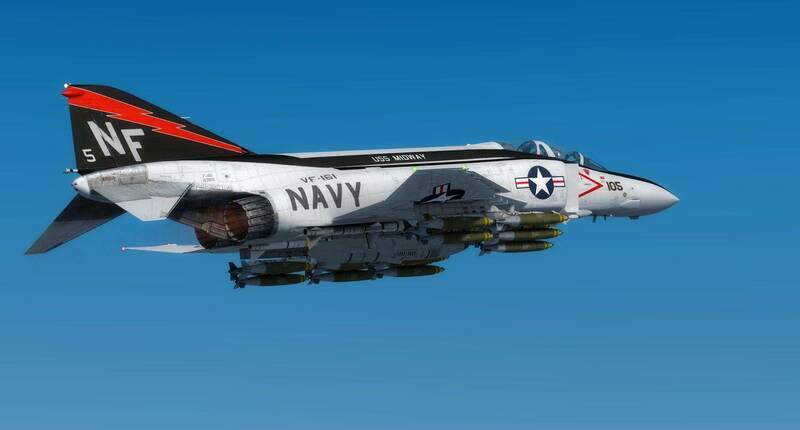 With enhanced air-to-air and ground attack capability, the huge, powerful Phantoms were at the forefront of carrier enabled power projection. After a production run of 522, deliveries of the F-4J ended in 1972. The F-4J served the US Navy Blue Angels from 1969 through to 1973; this period was the only time that both the Navy and Air Force demonstration teams would fly similar aircraft. Beginning in 1977, the F-4J was extensively modernized and designated an F-4S. Changes included smokeless engines, improved hydraulics, electronics, and wiring, as well as modifying the wings to increase maneuverability. In total, 302 aircraft were upgraded. 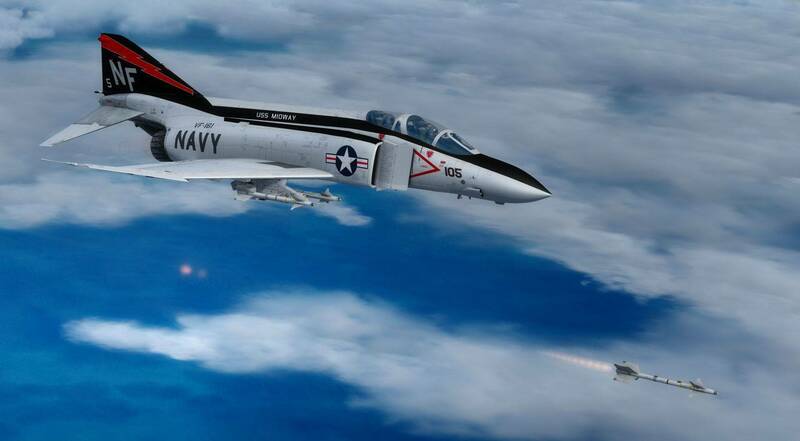 On 25 March 1986, an F-4S belonging to the VF-151 "Vigilantes," became the last active duty U.S. Navy Phantom to launch from an aircraft carrier, the Midway. 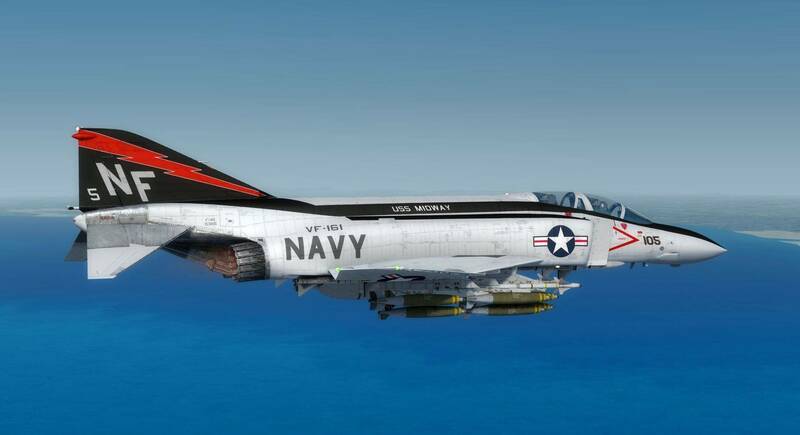 On 18 October of the same year, an F-4S from the VF-202 "Superheats", a Naval Reserve fighter squadron, made the last-ever Phantom carrier landing. 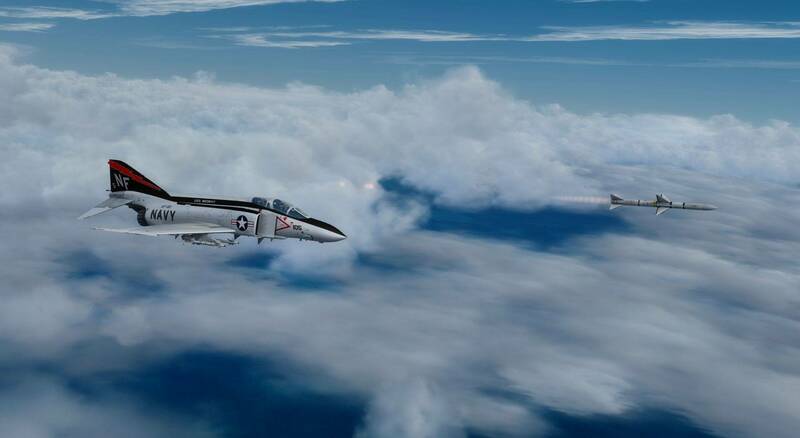 By 1987, the last of the Naval Reserve-operated F-4S aircraft were replaced by F-14's. 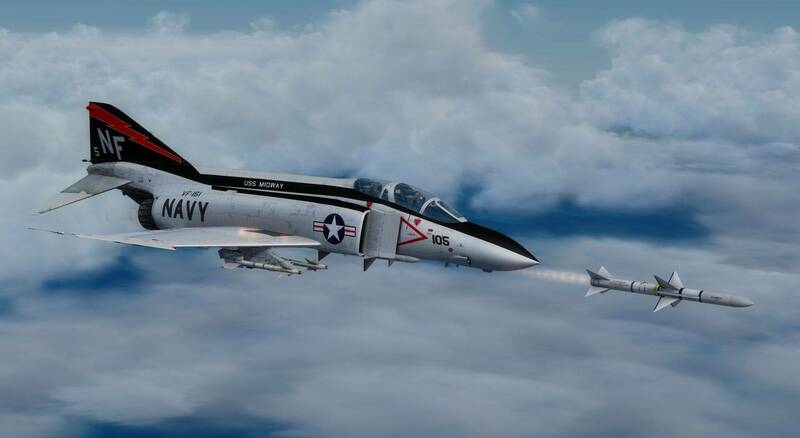 The Advanced Series MilViz F-4J and F-4S are fully carrier capable and complete with full TacPack integration, study level functionality and an external flight physics engine for an authentic Phantom flight experience. 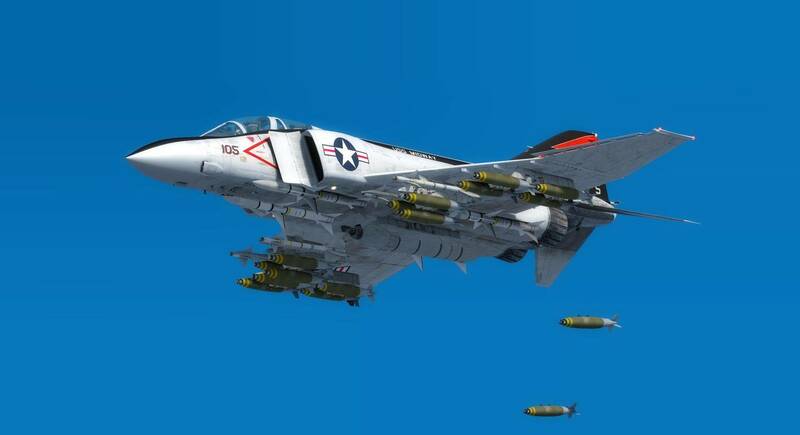 Features include realistic systems and avionics, realistic Air Data Computer (ADC), optional Instructor mode, realistic battle damage, top quality internal model with custom 3D gauges, scalable failures system, accurate drag model and realistic slats effects. Utilizing every resource available to us and spending countless hours in design, testing, revising, and more testing again, we're confident that our model represents an extemely true-to-life rendition of the real world aircraft. We've taken great care in presenting an authentic environment for the virtual pilot; closely reproducing the original in looks, systems, sounds and flight modelling. The cockpit of an F-4 represents a busy, complex workplace for the pilot. However, we've strived to perfect the feel of actually sitting in the pilots seat, being able to scan your vital instrumentation with a glance, all replicated with high resolution textures and smooth 3D animation. Being able to run through checklists, flipping all of the needed switches and toggles, monitoring systems as they spring to life. Being able to light the engines and feel the rumble of the massive turbojets behind you. Every bit of it, in your control and command! 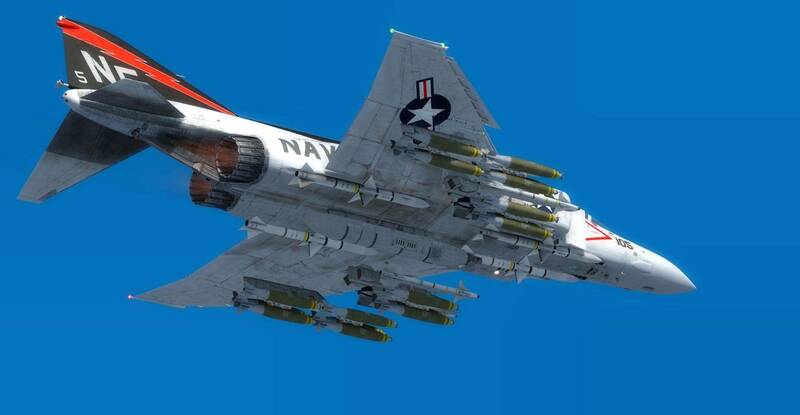 Please note: Only the cockpit layout of the later F-4S is replicated in this release. The Advanced Series F-4J/S module includes an external physics engine that is independent of the simulator. This allows the representation of highly accurate aircraft characteristics without the traditional limitations imposed by the default simulator physics engine. Stability and control derivatives are based of available wind tunnel and flight test data, translating into realistic aircraft behaviour in all possible flight conditions. A highly accurate, dynamically computed drag model exists for all aircraft configurations, including pylons, racks and stores. Along with realistic slats aerodynamics, extremely accurate modeling of the J79-GE-17 engines and dynamic inertial modeling, the F-4J/S ADV model accurately matches the performance figures of the real jet in nearly every aspect across all possible aircraft configurations. 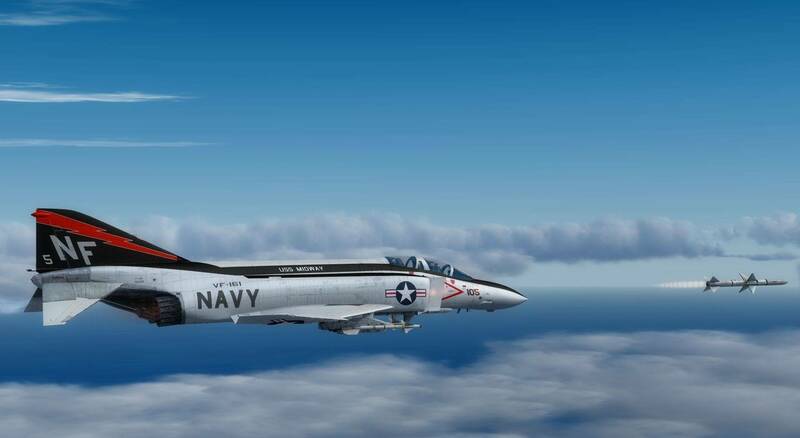 We're really not kidding when say the F-4J/S ADV module has some of the most advanced systems ever simulated in the FSX/P3D world. The F-4J/S ADV module allows a comprehensive system of aircraft failures, all able to be individually configured to suit any desired level of difficulty. Set to provide a fully realistic simulation experience, the failure capabilities will include not only realistic systems operation, but extend to cover the possibility of having a system failure with probabilities based on true failure rates. 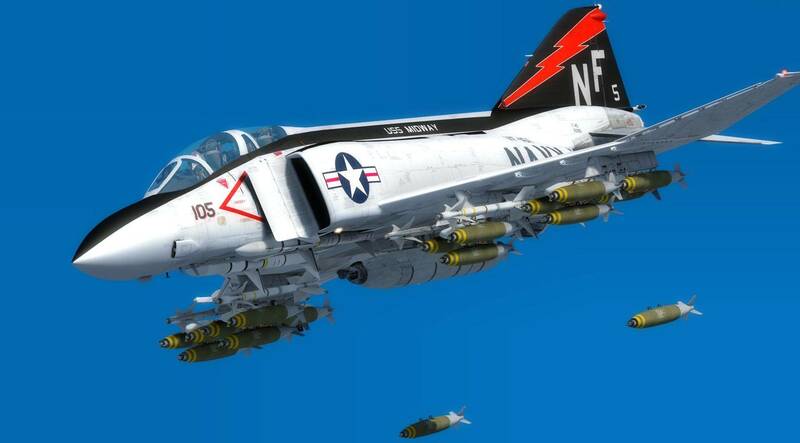 Although we are proud of what has been accomplished with the F-4J/S ADV in terms of systems depth and flight modeling, we completely understand that on occasion you might not want all of that responsibility. After all, even students need a break now and then! To that end, the realism of the included systems along with their associated limitations can be scaled from a 100% realistic experience with full system management under pilot control, all the way over to a easy / fail-free mode. 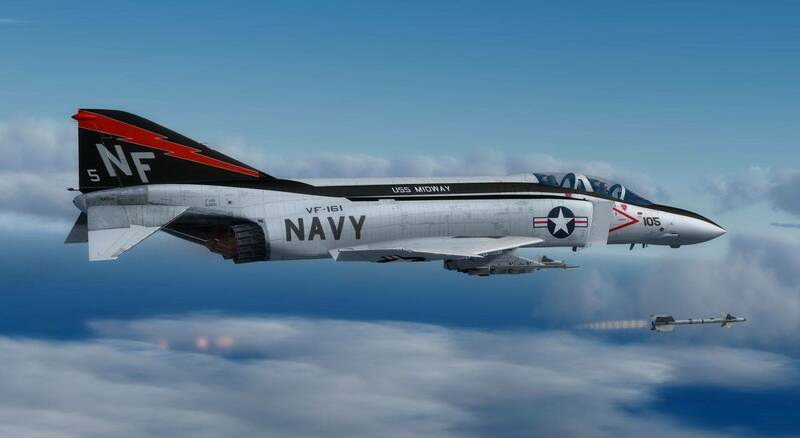 With maximum realism set and systems management under pilot control, there's no way around it: the Advanced Series F-4J/S is a very complex aircraft. Given all of this complexity, an "Instructor Mode" has been included. It can be selected to assist at any phase of flight operations, from engines start, to engines shut-down. 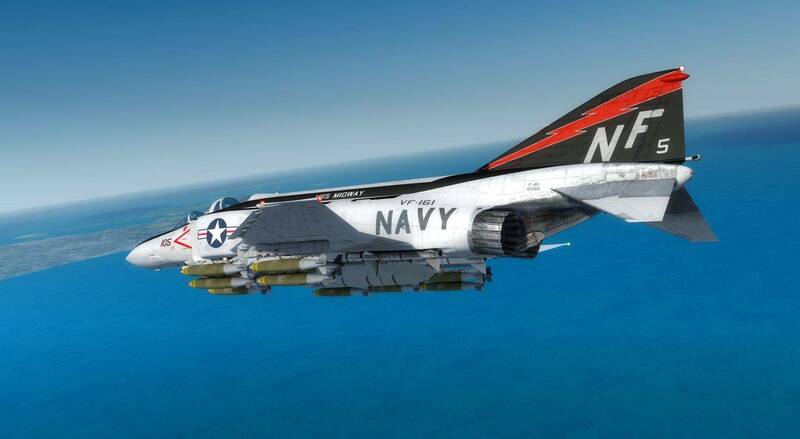 In this mode, everything from configuration changes and mis-operation warnings, right down to flying hints will be displayed just as if you had a real F-4 instructor sitting in your rear seat. Highly recommended during the familiarization period, this mode will help ease the learning curve typically associated with complex jets. 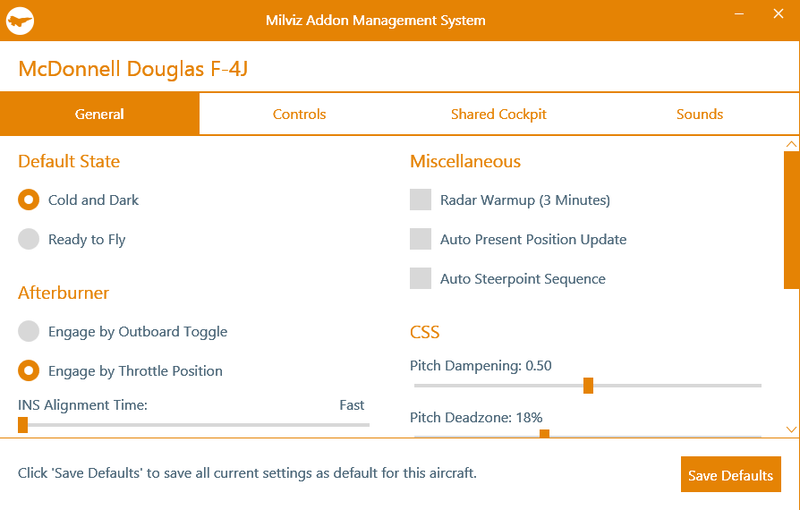 Our innovative MilViz Aircraft Management System (MVAMS) is included with this release. It allows for easy control and set-up of the aircraft, including configuring the default start-up state, radio frequencies, as well as allowing the setup of joystick axis. It also allows for easy notification and application of hotfixes as they are released for your aircraft. 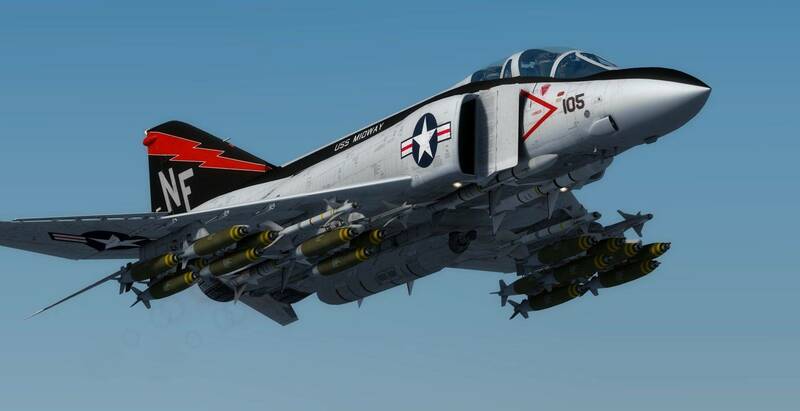 The Milviz F-4J/S Phantom II Advanced Series comes complete with full TacPack capability, enabling you to operate the weapon systems, fire guns, drop bombs, or launch rockets from your now-armed-to-the-teeth F-4 Phantom. 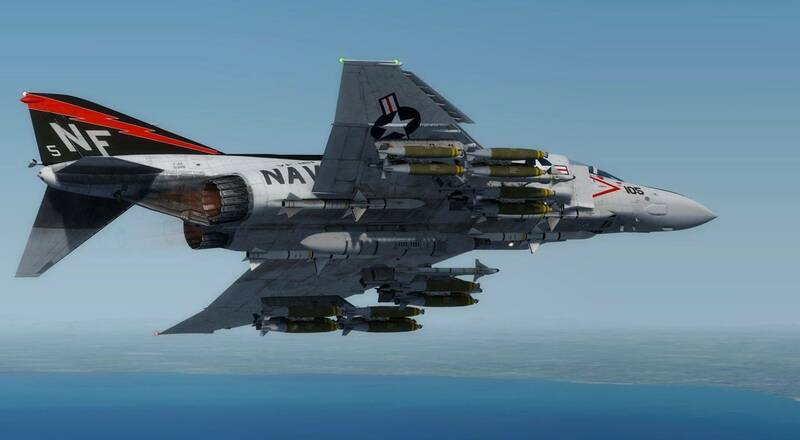 We've included a very large selection of authentic weapons and pods to outfit your F-4 with. Our configuration menu lets you setup and configure your payload any way you wish, allowing you to configure for almost any mission. And of course, adding or removing ordinance or fuel will have an appropriate effect on flight dynamics and handling characteristics. Important: All weapons in the Standard Edition are completely non-functional with the exception of jettison abilities. Separate TacPack software required for full weapons functionality; TacPack software not included.
" There is no doubt about it, these are a hell of an add-on." 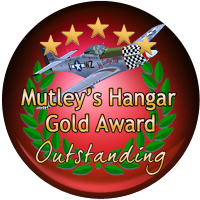 - excerpt from the review at Mutley's Hangar, where we are very proud to say the F-4J scored a 9.7/10 and received a Mutley's Hangar Gold Award! A glimpse into procedures desired from a Phantom driver. Tip: For magnetic declination, compare the Mag and HDG. Insert the following into simulator's .cfg: Backup first. MilViz Sale - 30% OFF!